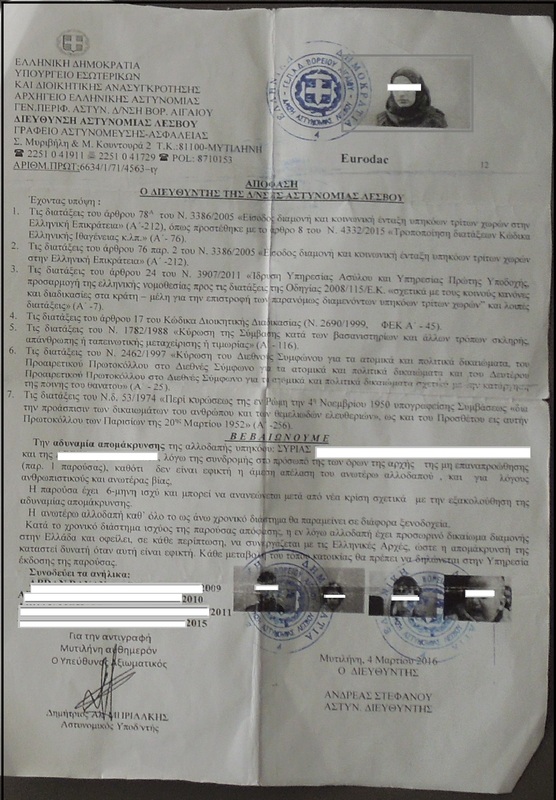 This is a typical registration paper obtained by the Greek authorities upon arrival in one of the islands (in this case Lesbos). It is a temporary permit stating that the bearer is allowed to remain on Greek soil for six months on the principle of non-refoulement. Children are registered on the same document. Once registered, this paper is the only official document the bearer has within Greece and it is written entirely in Greek. The refugees cannot -of course- understand what is really written in this document which will be subsequently stamped multiple times (usually on the back page) to indicate that the bearer is entitled to transportation within Greece, relocation procedures, access to food, temporary shelter and provision of health services. If lost, stolen or misplaced, the temporary permit is irreplaceable.